This product was designed with an absolute "cost no object" approach to component choice. 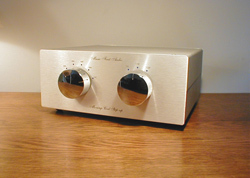 It is based around a transformer that takes moving coil step up to a new level. The 80% Nickel core used in this transformer is to our knowledge of the largest size ever applied to low level transformers. The result is virtually transparent MC step-up.